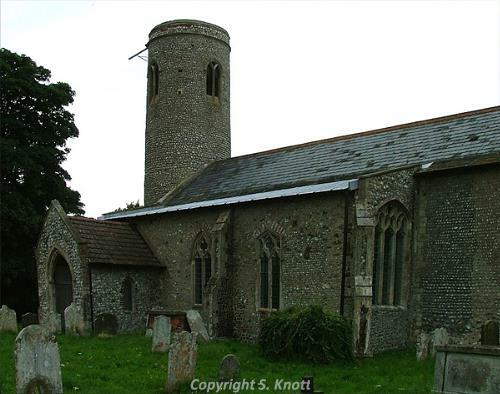 Thwaite is a small parish and village some 5km from Loddon, in the South Norfolk Local Government District. It has an area of some 275 hectares and the village has a population of around 60 people. The word ‘Thwaite’ is thought to derive from the Old Norse for clearing. The south of the parish cuts close to both Ditchingham and Broome parishes, and as such contains part of a landscape of Bronze Age to Iron Age features (NHER 11675). These are predominantly ring ditches, including one Bronze Age double ring ditch situated in Thwaite (NHER 44853). Less than 1km to the north is another possible Bronze Age round barrow which includes a now ploughed down mound (NHER 44825). Complementing this landscape are a number of Iron Age objects, comprising two horse harness fittings (NHER 40278, NHER 50249) and a copper alloy brooch (NHER 40279). Considering the small number of records held for this parish, only twenty, this is a surprising number of objects, particularly as one of the harness pieces and the brooch may date as early as the 1st century BC. Despite these early objects, indicative of settlement or use of the land during this period, there are no recorded structures from the Roman or Saxon periods, and only a single Roman brooch has been recovered (NHER 29353). There is also no mention of the parish or village in the Domesday Book, however there are a number of medieval features recorded. These include the remains of a possible medieval moat (NHER 10461), as well as the cropmarks of extensive medieval and post medieval enclosures and fields (NHER 44828). In addition, the survival of an attractive Norman style south doorway, thought to date to around 1140, at the parish church of St Mary (NHER 10447) is indicative of settlement and wealth in this area during the early medieval period. The church also received continued embellishment in the 15th century, with a new west tower, and the 18th century with a brick chancel. A medieval coin (NHER 50249), a 12th century papal bull and a 13th century belt stiffener (NHER 30941) have also been recovered from this area. Thwaite Hall (NHER 10460) dates to the 17th century, but may be built on the site of a medieval moat. The two storey building itself is timber-framed, and has a number of octagonal chimney shafts, as well as an associated 16th to 17th century timber-framed barn. Also of architectural interest is White House Farm (NHER 34092), a 17th century timber-framed house with a brick skin, and The Old Messuage (NHER 35920), which also dates to the 17th century and is timber-framed.